Haruichi Furudate writes good shōnen sports manga — I say this, because I’ve been really enjoying Haikyu!! lately, and I felt like I should explain why. To note, this post is going to spoil the last six or so chapters of the manga, which is currently on Chapter 338 and onward. The basic premise of the story is that our protagonist, Hinata Shōyō, is short, but wants to live up to the volleyball prowess of “The Small Giant.” The Small Giant was a shorter ace player who helped bring Karasuno High School to national volleyball titles, and, to Hinata, he’s an inspiration. The series hasn’t focused too hard on this, mostly because there’s a lot of mystique around him; a lot of the manga is devoted more to Hinata and the team’s development, rather than the conflict of this extraneous character. However, the concept of living up to his legacy pops up from time to time, almost nudging us to remind that it’s still there. 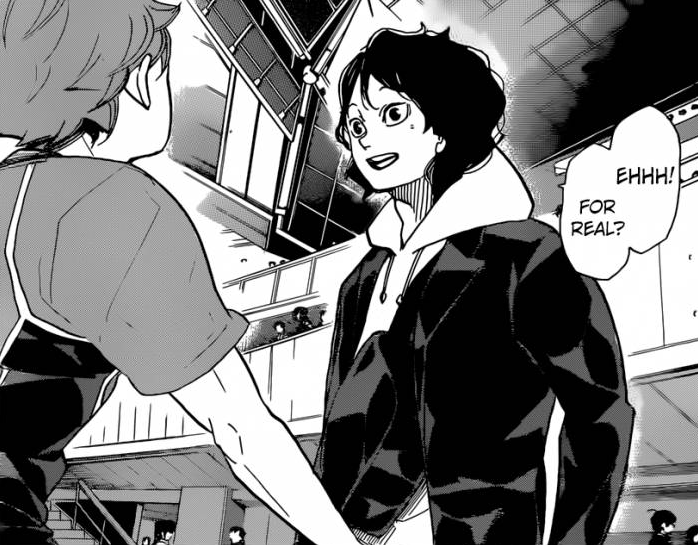 However, the manga does something that I really didn’t expect: it introduces The Small Giant before the match, and has him meet our protagonist. By normal conventions in other series, this would be a big, life-changing event: maybe he would be the final boss of the tournament, or a coach of a special team our protagonist would join. Since the beginning of the manga, he’s been set up as an unstoppable force, bathed in shadow — intimidating and alluring. When we do meet The Small Giant, we meet Tenma Udai, instead. Tenma quit playing volleyball after high school ended. We not only find out that Tenma doesn’t play the sport any longer, but that his skill didn’t earn him any rewards. He’s just a regular guy, and for all the series has built him up as a main motivator for so many people, he’s just… there. 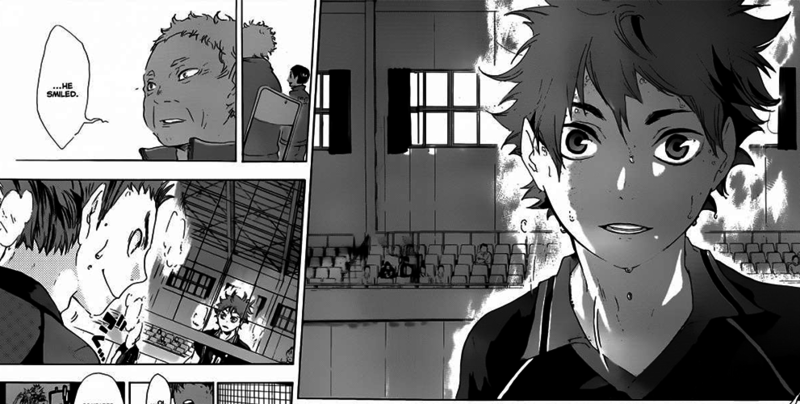 Hinata steps onto the court, and the chapter closes the issue with the line, “I wonder why, I…. 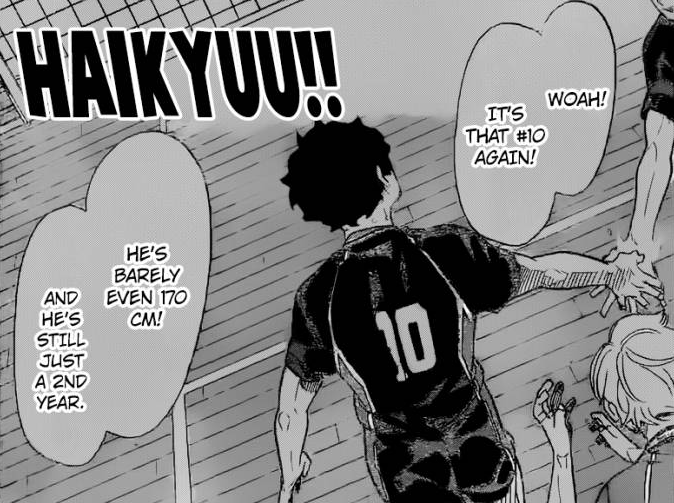 These couple chapters pulled me back into Haikyuu!! hard, because I feel like the author took a couple important steps by closing this story thread. It felt ballsy, and made a concrete statement by doing so. Through the last couple matches of this tournament, the emphasis has been on Karasuno High School (the main characters’ team) finding their own identities as players among their elite opponents. Having gone so far into the tournament, they are no longer a fluke team relying on manga magic to carry them in victories: they have improved to become a fundamentally-sound roster, and are a Top-8-in-Japan-calibre unit. Having Hinata meet his idol, be disappointed by the experience, and then moving on almost immediately is a marker of maturity from what started off the series as a stock shōnen character. He is no longer a one-trick pony with the “magical talent” of a typical protagonist, and the shoes that he needs to fill aren’t there anymore. Killing The Small Giant refocuses the story to be about the people in front of us — not the specter of someone so unbelievably good that it undermined others’ current talent. Through the series’ training arcs, we’ve seen Hinata exhibit curiosity and creativity at the sport of volleyball. That is what drives his growth now, rather than attaining an ideal set by someone else. 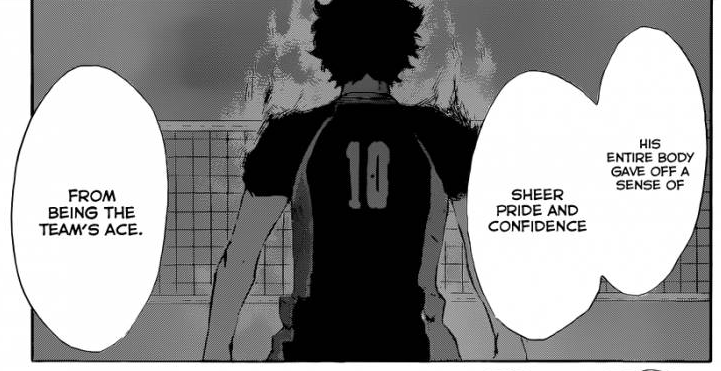 This encounter keeps that going; anything that Hinata is will be defined by his own relationship with volleyball, not by anyone else’s. 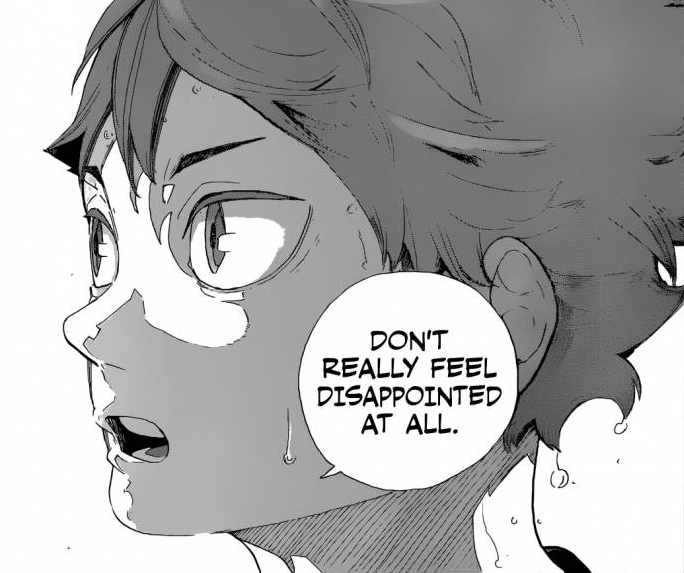 While we haven’t seen how the arc plays out, this potentially allows for an inversion of the storyline: The Small Giant can be inspired by Hinata’s play instead, and he might re-think about playing again. However, my prediction is that won’t matter too much in the grand scheme of things. Haikyuu!! does an amazing job of examining the personal aspects of competition, and how one’s relationship with their sport shapes them as people. Even the opponents aren’t really villains — they have their own motivations, and in most cases you come to respect the steps they’ve took to get this far themselves. While Haikyuu!! is a sports manga, the matches themselves are backdrops to the development of the characters, and that’s something I can appreciate. Haikyuu! !‘s story isn’t about Tenma Udai, though — it isn’t about The Small Giant getting that resolution because it needs to happen. He’s allowed to want to be okay with leaving volleyball in order to explain another aspect of sport: it doesn’t need to be a lifelong campaign, nor does it need to be anything more than the positive experiences it provided in the moment. These moments of finality are what I can appreciate as the manga starts its march towards completion. It drags us out from the fantasy land of “volleyball fixes all” and re-centers us as watching characters we like chasing a challenge that enriches them and makes them happy. Sometimes, that’s all it has to be.